The flexible slat chain conveyor is our flagship product – the cleverest on the market. Featuring inbuilt capacity to be endlessly reconfigured, it offers a premium solution for production systems with rapidly changing needs. Need a versatile conveying solution that supports your plant’s productivity and profit? This could be the answer. To learn more about flexible slat chain conveyor design and construction, speak to the experts at Smalte Conveying Solutions today. As one of Australia’s leading slat conveyor manufacturers, Smalte Conveying Solutions has the experience and expertise to engineer a custom solution to address your plant’s individual needs. Created using a modular component system, these conveyors are the ideal choice for plants with changing production needs. Our proven, well-established slat conveyor design allows for rapid customisation, delivery and commissioning, as well as quick expansion and modification in line with production requirements. This capacity for endless reconfiguration sets the slat chain conveyor belt apart from other conveyor designs and translates to an exceptional return on investment. Incorporating high-quality aluminium and stainless steel components, our flexible conveyor system is designed and built to last. 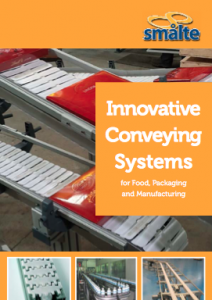 A custom slat conveyor system can effortlessly meet the needs of 3-dimensional applications – for example, providing simple overhead transport in order to open up floor space for food packaging facilities, improving operator access, and working with complex plant layouts.